The company recently bought ultraviolet lithography machines to make 7 nanometer iPhone processors, The Korea Herald said on Tuesday. Sources claimed that one of Samsung's three co-CEOs, Kwon Oh-hyun, was central to winning the deal, and visited Apple's headquarters in June. "The CEO could persuade Apple's top brass taking advantage of their close ties on OLED," one source said. Samsung is thought to be the lone OLED supplier for this year's "iPhone 8", since it controls 95 percent of the world's OLED market —companies like LG and Foxconn's Sharp are only now beginning to ramp up their production capacity. Samsung won't replace Apple's current processor maker of choice, TSMC, the Herald said, citing various other reports. Instead, the two companies are expected to share orders as with the iPhone 6s. In the meantime Samsung is said to be nearing completion of testing its new equipment, after which it will look to get final approval from Apple. 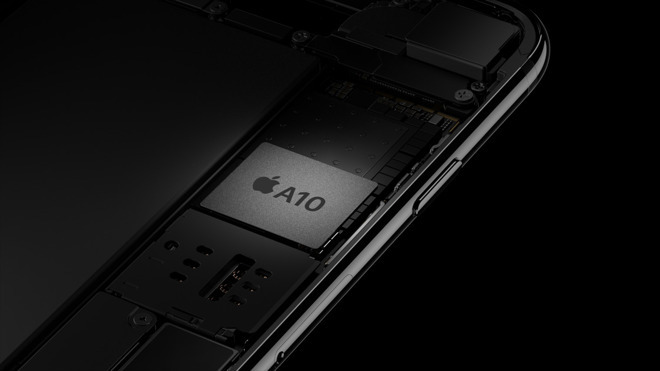 TSMC has largely monopolized A-series production since 2014, likely because of Apple's interest in distancing itself from its main competitor in smartphones and tablets. It otherwise tends to have multiple suppliers for any major component, however, since that forces price competition, reduces bottlenecks, and helps meet the quantities needed for global launches. This year's iPhones —including the "8", "7s," and "7s Plus" —are allegedly encountering production delays, though not because of processor issues.